Horticulturist. That is what I said my father was. I discovered this fancy term for farmer from my guidance counselor after a secondary education assessment, a test to see what vocation would best suit my interests, talents, abilities. As an aside, the test came up clerical for me and the only time I heard that word was in the area of religion. I did not want to be a minister. Well to my relief, it did not mean that kind of clerical and I did not seek out the other one either when it came time to find my career. Anyhow back to horticulture and living on a “fruit farm” or orchard. The farming era of mid century was a never ending playground for a kid growing up. 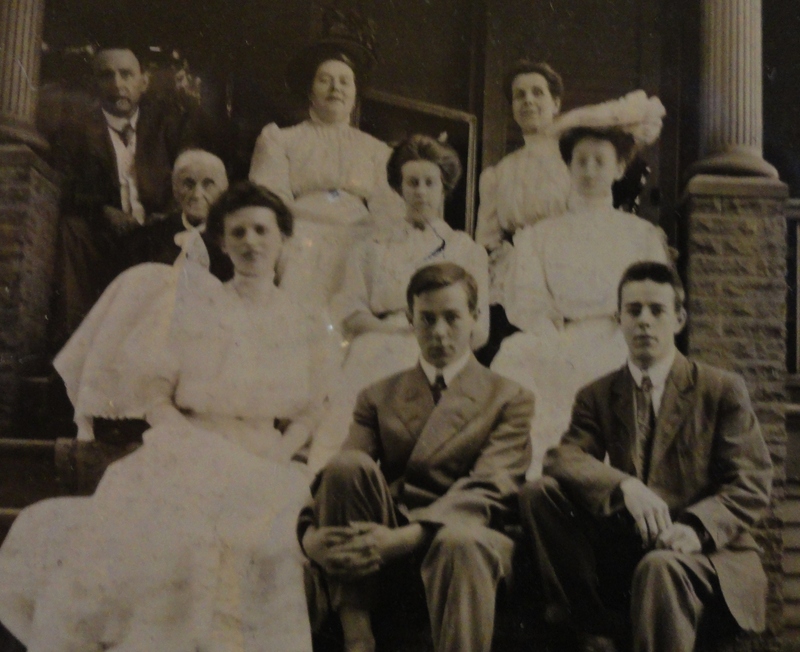 We lived 8 1/2 miles from the county seat or larger towns in our county and 4 miles from a tiny burg where we attended church and in the early years, school. We had only one neighbor, they were people who were crop farmers with some chickens, cows, and pigs. I loved going up the hill to their house because they were working a “real farm”. They separated their own milk and made their own cream and butter. They collected their own eggs and sold the extra. They hand cranked their corn into finer grain for the chickens and pigs. Mr. O’Blennis was always a fascination to me because he had missing fingers from farming accidents of the past, perhaps from a harvester. I tried to look at his hands without being noticed. Farming was dangerous, I observed. to the farm after a slight interruption of WWII. As a group they formed a partnership of Stone and Sons and purchased a farm for each son. Each farm had its own unique name: Eden Hill, Narrow Gauge, Dry Hill, and Thorn Hill, the latter being the farm that I knew as home for my first 20 years. Winter months were somewhat quiet on the farm. 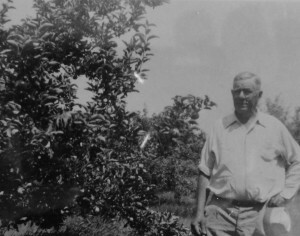 Once the bitter cold of January left and February would arrive with more sunny days, my father and his small troupe of workers would get down the snowshoes, bear paw, and bear cubs, and pruners and take off across the deep snow into the orchard to do the annual pruning back of the limbs. Limbs were made shorter with small hand saws and the suckers ( the many little limbs that grow along main branches) were clipped off with long handled pruners. The branches would fall onto the snow and be dealt with once the snow thawed and left in the Spring. In April, before the growing season officially started, the brush from pruning would be swept out into the row to be collected with tractors with special fork like features on the front that could pick up a pile of brush in one sweep and then move it to a pile that slowly grew to a giant mass. With the coming of the rainy spring time would come the biggest bonfire you could imagine. A huge trench would encircle the fire for safety and we could see it burn down into smokey embers after a few days and provided a spooky glow in the dark of night. Late Spring would bring the fear of frost and the loss of the crop. My dad had a fascinating alarm system. 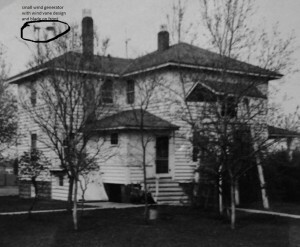 We had tower outside of their bedroom which supported a small windmill (as circled above the roof ) that powered two electric lights in the house: one upstairs and one downstairs; this was in 1948. The tower also held a thermometer with a temperature sensor that sent a signal through a wire from the tower into my Dad’s bedroom. If the temperature was approaching 32 degrees, and alarm went off and my dad would leap out of bed and head outside. 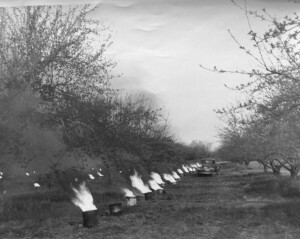 Before the days of environmental concern, smudge pots ( large lard cans filled with oil) were placed out in the lower orchard which was more susceptible to frost. My dad would ignite the smudge pots which would heat up the air and get it circulating to keep the frost from settling near the ground. The only problem with smudge pots was they created a filthy atmosphere within the orchard area. I remember my dad coming in the house looking like he had been in minstrel show. 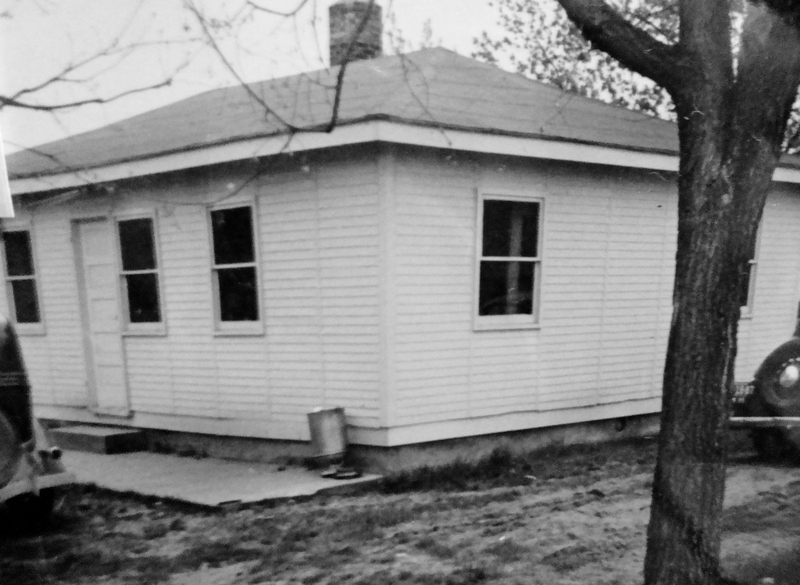 My 2nd floor bedroom faced the orchard and when I was perhaps eight, I remember awaking to see the orchard and early morning sky ablaze with fire and dense smoke from the smudge pots. I even remember sneaking down the TV antenna tower and across the yard into the edge of the orchard in my pajamas, feeling so brave and clever, but fearing being caught. To witness the activities of the night from the shadows of the yard was exciting. The use of smudge pots in this particular low lying orchard usually failed to prevent a bud killing frost. In the Spring and summer our slumber was interrupted with the whine of a sprayer late at night or in the early morning. My dad was the original Darth Vader in his spray mask and spray suit. His voice was oddly altered by the huge circular attachments on the front of the mask that would filter what he was breathing. Although, I doubt that it could totally filter out the DDT and lead that was used for years. Perhaps the spraying costume was where Steven Spielberg got his inspiration. me up the spike ladder, I was fearless and loved the challenge, while he held the giant ladder in place. The only way I could ever pick was if some local people would allow me to work with them. I could earn some spending money, which was fun, and rub elbows with people from a world away while they chattered away in their native languages. It was usually a 2-3 week window of time in which I did not mind getting up early with the birds and going out into the damp morning air to work. As the day progressed I would need to peel off the jacket and at noon finally break into the delicious lunch prepared by my mom in an “official” lunch pail. Accompanying the lunch pail would be a thermos of ice cold lemonade. It was a picnic everyday that I worked. And my mom was the queen of interesting sandwiches. Sometimes we even had hot soup in a thermos with the sandwiches. My dad, brother, and I would gather together to eat at some times, other times I would settle in with another small friendly group. Our quiet little farm always became quite lively once the migrant workers came for the summer. Saturday nights stand out in my mind. 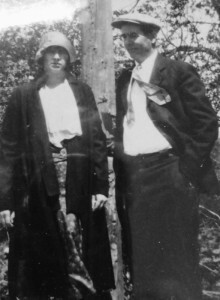 The workers worked a half day, then would come back to the farm and get all showered and gussied up in their best finery and go to town. One group from Tennessee particularly loved the old piano we had moved from our basement out in their housing. They could really make those ivory keys rock late into the night, fueled by a bottle of their favorite beverage and lots of play by ear musical talent. There were times that the different ethnic groups did not get along. So the situation was solved with some working the orchards and others the Christmas trees. 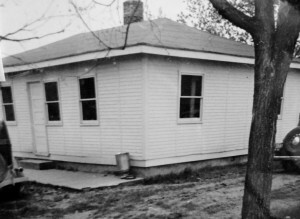 Once they left it took a while to get used to their absence and the empty housing. Sometimes it was my job to go through all the housing and scrub it down for the next year. 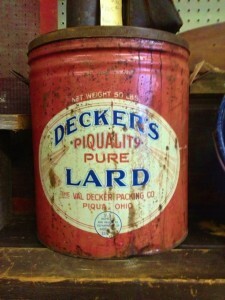 I usually would find some interesting tell tale remnants left behind within the rooms that emanated kerosene, cooking oil, and exotic smells. After cherries were finished, so was I pretty much. It would soon be time to go back to school. The harvest would continue from cherries, to peaches, apricots, plums,pears, and finally apples. I would love getting off the bus after school in the Fall and quickly changing into play clothes so I could run out into the orchard and hang out. Many of the people who worked for my father were friendly and always glad to see me and get a little kidding in to make me mad, blush, or laugh. At quitting time,If I was lucky, I might get a chance to help drive a tractor or pick- up back from the orchard to the house. Growing up on a farm, you learned to drive before you were ten. The apples were picked into small bushel wood slat crates and then stacked on pallets that would be moved back near the house. In the 40’s the barn floor had been cleverly designed with rows of water-ways separated by cement dividers. The water-ways could be filled with water after the pallets of apples were stacked in the storage room. The water would provide moisture to the air to help maintaining the quality and the freshness of the fruit. 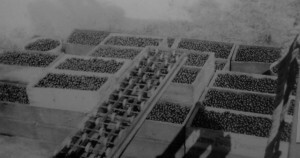 In the 60’s the partnership built a cold storage for storing apples until they could be processed. Once the fruit was off the tree, then the indoor activity of “packing apples” began. It would last for several months. 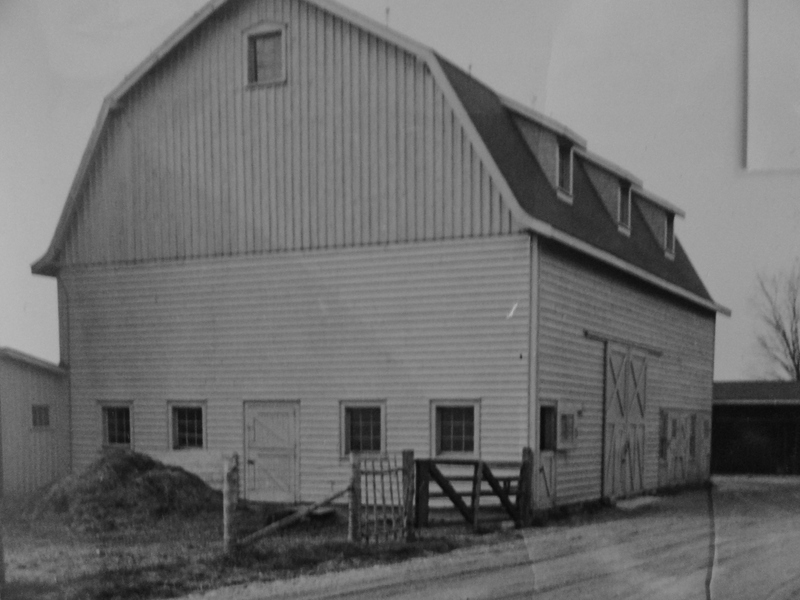 We had a Packing shed, which was a long building attached to the barn, heated by barrel wood stoves, with long rows of conveyor machines that moved the apples from point A to point B, to sort and size the apples. The small apples would fall through holes and down a chute into crates to be used for something else. The number 1 apples would continue to roll over belts to machines that would bag them by weight. I loved running that machine if someone had to leave. A bag would be placed on a special feature of the bagger and apples would roll down the belt and into a bag. The conveyor would stop once the desire weight was reached. Them the bag would be removed, twisted and secured with special tape and placed in boxes. If I didn’t get to sort apples or bag apples, then I got to make boxes. I think I got paid 10 cents a box. I would fold these large boxes and use a giant floor stapler to secure the bottom flags. I would get a rhythm going and try to beat my rate of boxes made per hour. I would be a box making fiend, with the money adding up with each box. 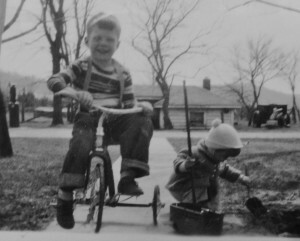 Pretty cheap labor, in retrospect, but then I was a kid. There were so many different jobs to do in the packing shed. Our fruit would be shipped out in semi-trucks, at least once or twice a week through December and sometimes into January. Stone and Sons contracted with a fruit distributor, Blue Goose, in Grand Rapids who helped market their harvest. 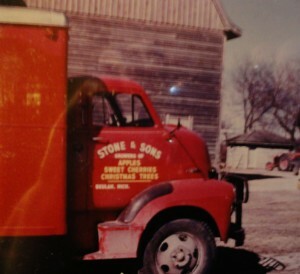 Prior to those days, my dad would load up a truck load of fruit and go to Bay City late in the evening and camp out in the Bay City Fruit Market. Once the market opened up in the wee hours of morning, he would sell to grocers, restaurants, and other buyers. I thought that was pretty exciting and went with him one year, I think I slept through the whole event. We did ” Pick Your Own” in the 60’s, this idea of selling fruit was found to be a way to market fruit without incurring harvest wages. Onnce people were in the orchard my dad loved to explain to people the differences of the various, fruit and how to use them, and the growing processes and innovations. People were always fascinated to talk to the actual grower, it was usually a curious novelty to them. Any apples that landed on the ground from wind (windfalls, grounders, or pick ups) would be sold at a cheaper rate and people could use them to make cider, pies, sauce or use for deer bait piles. I had the opportunity to man the “Pick Your Own Station” near the end of our yard. That was how I learned to make change. My dad finatically worked to teach me how to count back change, then on weekends and after school, he would set me out by the orchard and the “Pick Your Own” sign, a table, a little cigar box of money and carbon receipt pads. Sometimes I worked out of a trunk of a car. I could hop inside when there was no business and keep warm or listen to the radio. The days the weather was sunny, were much more enjoyable. The times it was cold, damp, and windy, it was not so great. But it was another way a kid could earn a buck on the farm. My brother, I would have to say, benefitted the most from living on the farm. We had a foreman who was a gifted mechanic. This foreman mentored my brother on the art of mechanics through his preteen and teen years. He learned how to completely service and fix ANY vehicle on the farm. One of the events that really drew him into the world of machines would have been the summer he and the foreman, Victor, build a go-cart from scratch ( they used a motor from a lawn mower). They also made a little motor scooter. My brother learned how to weld and take apart engines. Those lessons have served him his entire adulthood from farm to golf courses. All in all, my brother and I were fortunate to be exposed to life on a farm and all the lessons that could be learned and all the interesting people we came in contact with that worked for the business. We learned work ethic and that the farm did not tick to an 8 to clock. When things had to be done, they were done, no matter the time of day. Many things were done as a team, everyone pitched in until the job was finished. We learned to look for what needed to be done, and did not wait to be asked to do something. All great life lessons. I am pleased with my Grandfather’s foresight that farming would provide a wonderful place to raise the next 3 generations. It most certainly was for me and I often ponder those early years of my life.